Sir Alex Ferguson returned to Old Trafford for the first time since undergoing brain surgery in May and was given a hero's reception. Ferguson suffered a brain haemorrhage after falling ill at home, but he has made a good recovery and posted a video in July to thank the medical staff who looked after him. 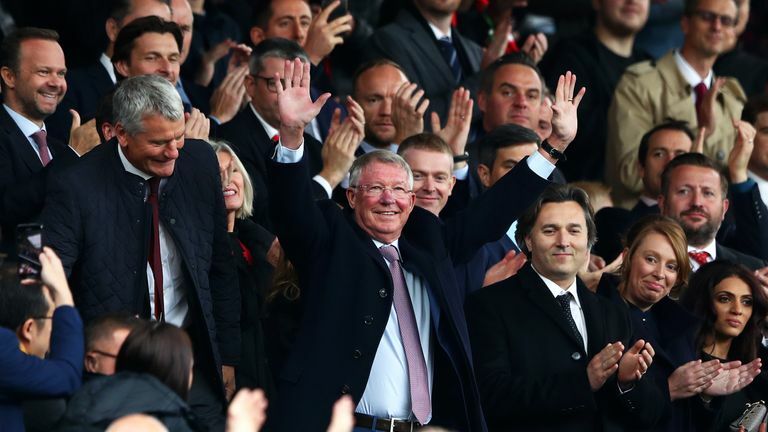 The 76-year-old has now made a return to public life and was given a standing ovation as he took his seat at Old Trafford ahead of Manchester United's Premier League game against Wolves on Saturday. The stadium announcer said the club was "overjoyed and delighted," as well as "relieved" to see him back at Old Trafford and he smiled broadly as fans applauded his return. United were held to a 1-1 draw by newly-promoted Wolves but Jose Mourinho paid tribute to the special supporter after the game. "It is fantastic news for everyone, not just for the Manchester United family, I think for everybody," Mourinho said. "Who in the whole world of football, even in the world, is not happy with Sir Alex Ferguson back and healthy? So great news for everybody." Ferguson spoke to MUTV before the match and admitted he was feeling a mixture of nerves and excitement on his return to the club. "It's really good [to be back]," he told MUTV. "It's obviously been a long journey but I'm making steps forward, doing what my son tells me and what the doctors tell me, so it's really good. "I'm a bit nervous, to be honest with you, maybe a bit tense really because the last game was Arsenal back in April. It was a long time but it's great to be back and I just hope we get a win today. "It's great to go back to the stadium and it's going to be quite emotional for me when the game starts. It had to happen some time and I've been looking forward to it. It was important getting the right time and the right rest before coming to a game. "It's bound to be emotional, particularly when I take my seat in the box. That will be something, you know. I'll be glad when the game starts and I can enjoy it." The Scotsman won 38 trophies during his 26 years in charge at United, including 13 Premier League and two Champions League titles.